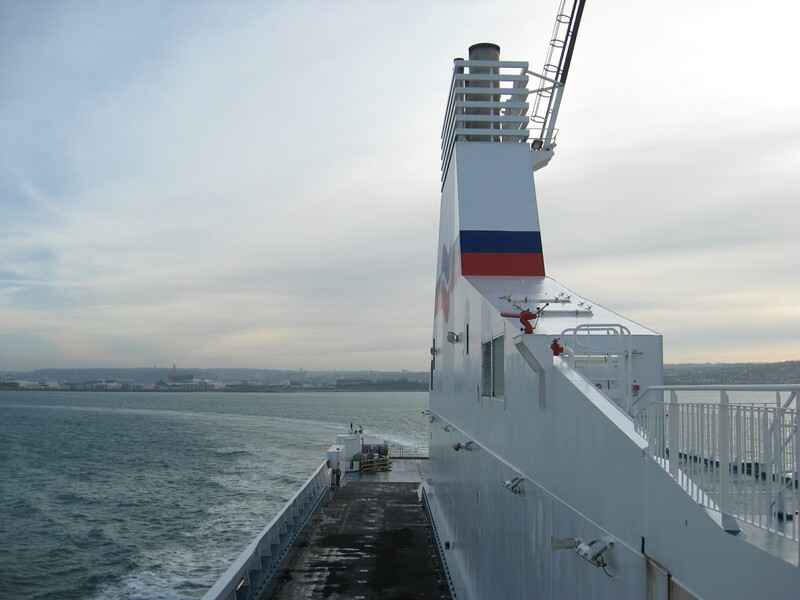 This voyage, from Poole to Cherbourg, was conducted in January 2010. 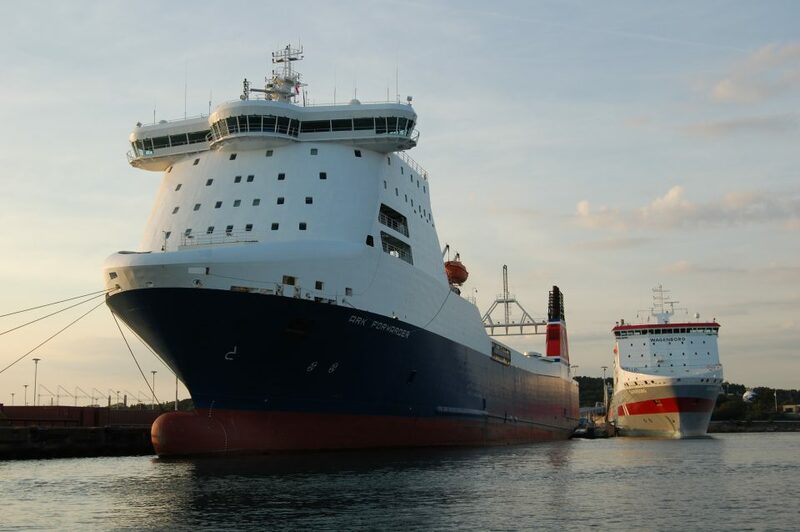 For those of you who are not familiar with M/V Cotentin, she is the first of two similar vessels ordered by the French ferry operator Brittany Ferries at Aker Finnyards in Helsinki, Finland. The second vessel, M/V Armorique is, however, a further developed concept with more passenger facilities, no upper lorry deck and should not be considered a sister vessel. The 19.000 GT Cotentin was delivered, slightly delayed, in November 2007 and was introduced on the Poole (UK) and Cherbourg (FRA) service, with a weekend crossing to Santander (ESP). The weekend crossing to Spain was started due to the French highway weekend ban for heavy trucks. With the exception for Santander, all ports have two tier loading with linkspans. 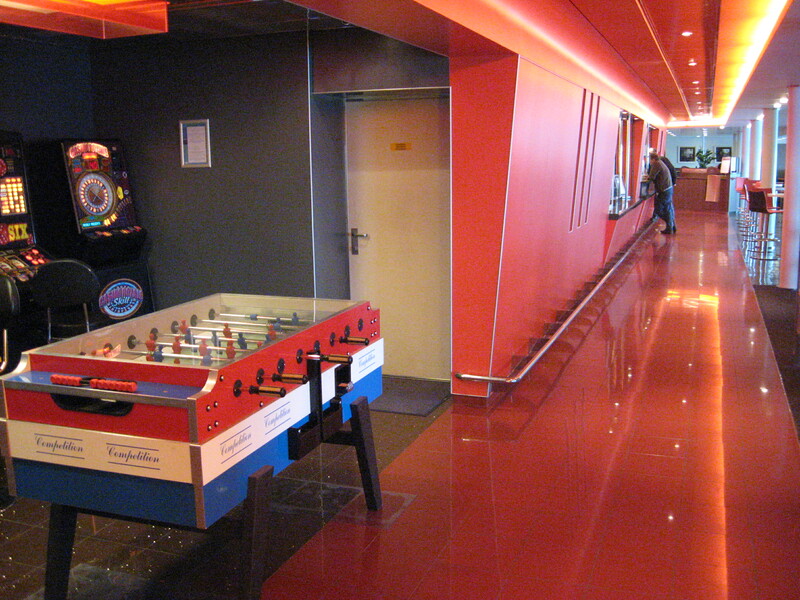 In Spain, the vehicles are discharged by an internal ramp between the main and the weather deck. In total, the Cotentin has 2188 lane meters, with approx 1000 each on the main deck and weather deck + an aditional 175 on the tank top. The passenger capacity stays at 160 people, which clearly indicates that she is first and foremost, a trailer ferry, rather than a luxurious cruise ferry. However, the interiors are in no way sub-standard. 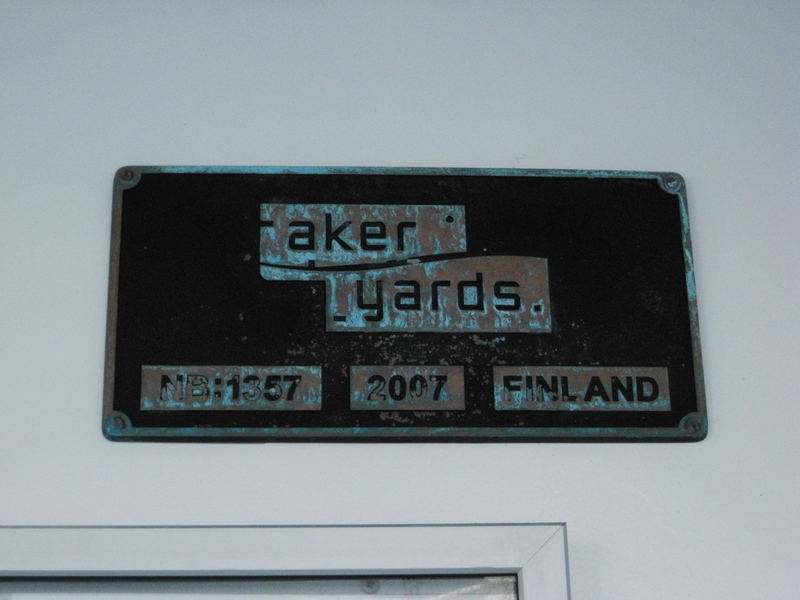 The restaurant, the lounge and the small shop appear as intelligently designed and inviting. The Cotentin is powered by a pair of MaK 12M43C, 12-cyl, medium speed V-engines, connected to a pair of Flender reduction gears and a pair of Wärtsilä Lips propellers, that give her a service speed of 23 knots and a trial speed (without cargo – of course) of an impressive 27,6 knots. The fuel (HFO IF 380) consumption is approximately 96T/24h. The total ME effect is 24,000 kW. The auxillary engines consist of 2 x Wärtsilä 8L20 with a total effect of 2880 kW. For manouvering in port, she has two Wärtsilä bow thrusters. As this crossing was conducted in 2010, some (if not most) of the memories are not that clear anymore and therefore, I won’t go into details. Though, I do remember that the entire vessel was very clean and the maintenance was kept at a very high level. The crew and the owners are very proud of their fleet and it’s activities. 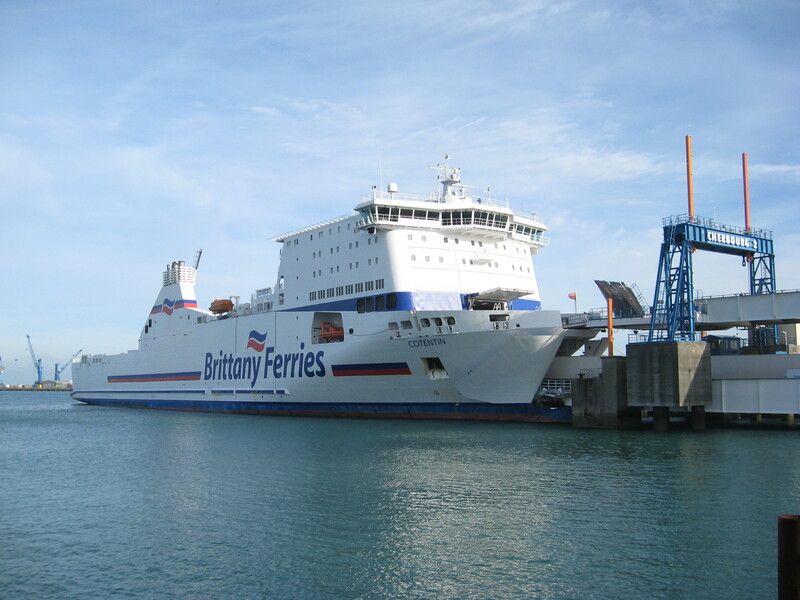 As a matter of fact, Brittany was started in the early 80’s due to the disappointment about the existing (or non-existing) ferry services between France and Ireland/UK. 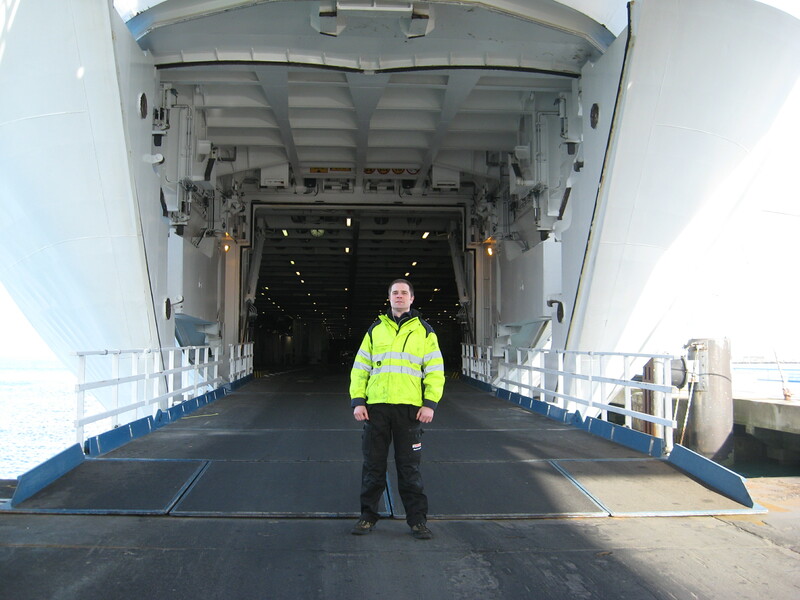 Generally speaking, the Cotentin is a high quality vessel, built by one of the most experienced RoRo yards. 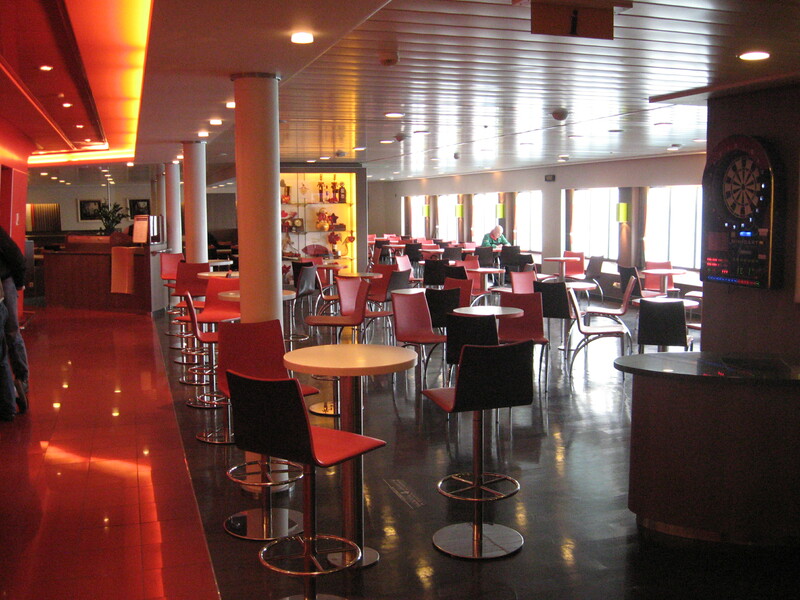 Each company in the maker’s list is well known, and it’s obvious that Brittany Ferries, at the time the vessel was ordered, were aiming for a top notch vessel, and no compromise, neither technically nor financially. It’s not one of those vessels that you would bring your kids and family onto, for a weekend of entertainment, but a very well planned and smart looking workhorse for trucks and their drivers.